Below is a short list of lodging and dining establishments along with their contact information. Many of these are also marked on our downloadable map. Click on their name or logo to visit their website. 15 min drive to campus. A twenty minute drive to campus. This is a large hotel on the south end of Kalispell. A hotel located on the north end of Kalispell. 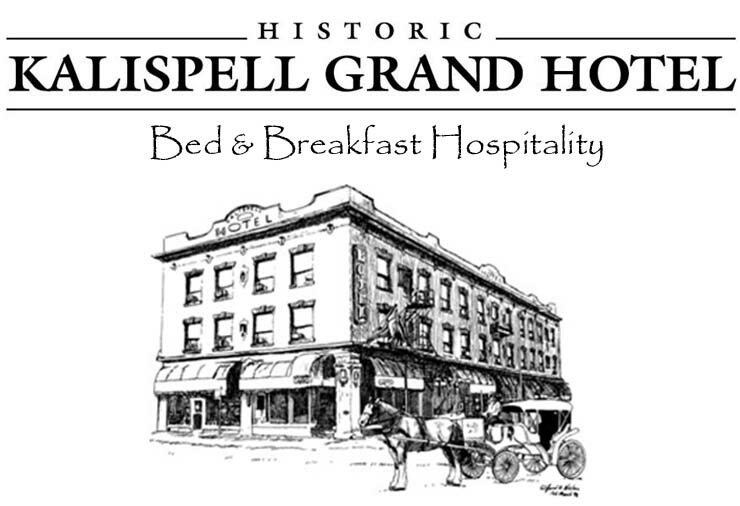 Historic hotel located on Main Street in downtown Kalispell. A fifteen minute drive to campus. All suite property, Rates include Breakfast & light Dinners. Several resturants & shopping in walking distance. Located across Hwy 2 from Walmart. Located next to the Kalispell Center Mall. Numerous restaurants within short walking distance. Click here if you would like to take a look at other lodging establishments in and around Kalispell. Here you will find directions, reviews and links to the hotels listed above, as well as many others. A forty minute drive to campus. Located at the South end of Whitefish. A fifty minute drive to campus. Located on the Whitefish Mountain Resort. Near Whitefish Mountain Resort and Whitefish Golf Course. A 40 minute drive to campus. A thirty minute drive to campus. Located between Kalispell and Whitefish. Click here if you would like to take a look at other lodging establishments in and around Columbia Falls. Here you will find directions, reviews and links to the hotels listed above, as well as many others. Click here for information on local dining establishments in and around Kalispell. Here you will find directions, reviews and links to a large variety of restaurants in the Flathead Valley.